Immelman withdrew from the 2006 Open Championship to be present for the birth of his first child. He finished 2006 in the top 10 of the PGA Tour money list and was named Rookie of the Year. 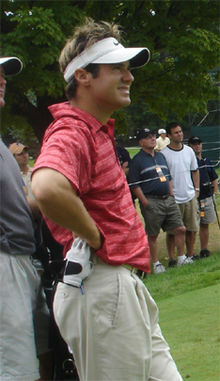 In September 2007, Trevor Immelman was picked by Gary Player to participate in the 7th Presidents Cup held at the Royal Montreal Golf Club, Canada. The International team lost 14.5 to the US team's 19.5. On 13 December 2007, Immelman withdrew from the South African Airways Open due to severe discomfort around his ribcage area and a problem breathing. He went into surgery the following Tuesday, 18 December 2007, and doctors discovered a lesion approximately the size of a golf ball on his diaphragm. (Immelman remarked in an interview on the obvious irony of the size of the lesion). It was diagnosed as a calcified fibrosis tumor. After more tests they discovered that it was benign. Nevertheless, treatment and recovery caused him to miss the first eight weeks of the 2008 PGA Tour season. However, Immelman came back to win the 2008 Masters Tournament. Despite scoring a double bogey on the 70th hole, the par 3 16th, Immelman finished with a score of 8 under par, beating favourite Tiger Woods by three strokes. In June 2009, Immelman announced he would withdraw from the U.S. Open due to tendonitis in his left wrist and elbow, which plagued him for much of the 2009 and 2010 seasons. As the 2013 PGA Tour neared its conclusion, Immelman's winless streak extended to five years; he was forced to play in the Web.com Tour Finals after he failed to make the FedEx Cup playoffs and his five-year exemption for winning the Masters expired. Immelman won the Hotel Fitness Championship, the first of four Web.com Tour Finals tournaments, and finished the Finals in sixth place to regain his PGA Tour card for 2014. Immelman married his childhood sweetheart, Carminita, on 6 December 2003. He has frequently participated in his mentor Gary Player's charity golf events around the world to help raise funds for children's causes. Immelman has a residence in Winter Park, Florida that he purchased in 2016 from former professional football player Jeff Faine. ^ "The Presidents Cup – Past Results". PGA Tour. Archived from the original on 2 February 2014. Retrieved 28 January 2014. ^ "Immelman undergoes surgery to remove growth on his diaphragm". PGA Tour. 18 December 2007. Archived from the original on 20 December 2007. ^ Dorman, Larry (14 April 2008). "Immelman Survives Pressure to Win Masters". The New York Times. Retrieved 26 May 2010. ^ "Immelman withdraws from U.S. Open due to injury". PGA Tour. 14 June 2009. ^ Fluker, Anjali (7 September 2016). "Former NFL player sells Winter Park luxury home for $4.55M". Orlando Business Journal. Retrieved 19 October 2018.